I met my friend Tom in midtown Manhattan this morning at Speedy’s cafe. To plan our monthly comedy variety show. Called Major Babe Time. During our meeting, I drank a large iced coffee with milk. No sugar. Coffee is glorious because I feel great after I drink it. After the meeting, I walked downtown towards New York Vintage. A vintage clothing store on W25th. I’d never been vintage shopping before. I wanted to look for beautiful dresses to wear in my character photos. The New York Vintage storefront was tucked away under an awning. I looked through the front window. The store looked narrow and seemed to be filled with rows of 1920s flapper dresses. The store looked intimidating. “Ring Bell to enter,” the front door sign read. I did not want to ring the doorbell. I did not want to deal with having someone come and answer the door. And ask me why I was at the store. There were no customers in the store, so all the attendant’s attention would be on me. I did not want to deal with the interaction. “What’s the worst thing that could happen inside that vintage store?” I asked myself. “The store attendant would follow me around inside the store and ask how I felt about every dress I looked at and then say, ‘Why are you even shopping here?’,” was the worst thing I could think of happening. It is so ridiculous of a reason! I walked back and forth outside the store 4 times. Up the block towards 6th ave. Then back towards 7th ave. Then up towards 6th. Then back towards 7th. Every time I passed, I glanced inside to see if other customers were in the store. “If there was another customer in the store I would go in,” I thought. The pressure would be taken off me. It is so funny to me how such a trivial thing as walking into a store can cause me to think so much. But it does. There were no other customers. I did not go into the store. I walked away. I headed further downtown towards another vintage store, Shareen Vintage. I thought it might be a more populated store. With no door bell. I arrived to the address, 13 W17th street. There was a hair salon. And a restaurant. No vintage store. A handy man noticed I was lost. “Are you looking for Shareen Vintage?” He asked. “Yes,” I said. “But I’m good, I don’t need help,” I wanted to say. “I’m the super of the building. People always get lost looking for it,” he told me. He and I stared at each other. He was waiting for me to make a move. “Go in,” he told me nicely. Smiling, I walked up the stairs. I pressed the buzzer. “Hello. Shareen Vintage. How can I help you?” a friendly girl’s voice said. “I’m here for the vintage clothes,” I said. I didn’t know what else to say. She buzzed me in. I walked inside and up the staircase to the second floor. At the end of the hallway was an open door with a girl standing in the doorway. She was probably 23 years old. She had long wavy brown hair. Dressed in a copper button up silk shirt with a silk rose sewed on the collar. “I bet that’s a vintage shirt,” I thought. “Hi. How are you?” she asked very nicely. “Good,” I said with a smile. I stepped inside the store/apartment. There were three woman sitting on a couch. Looking at another woman in front of a mirror, trying on a white vintage wedding dress. “I don’t like the v-neck cut of this one,” the bride was telling her friends. Like Speedy Gonzalez, she sped-walked to the dressing room to help the bride change dresses. I walked to the back room. 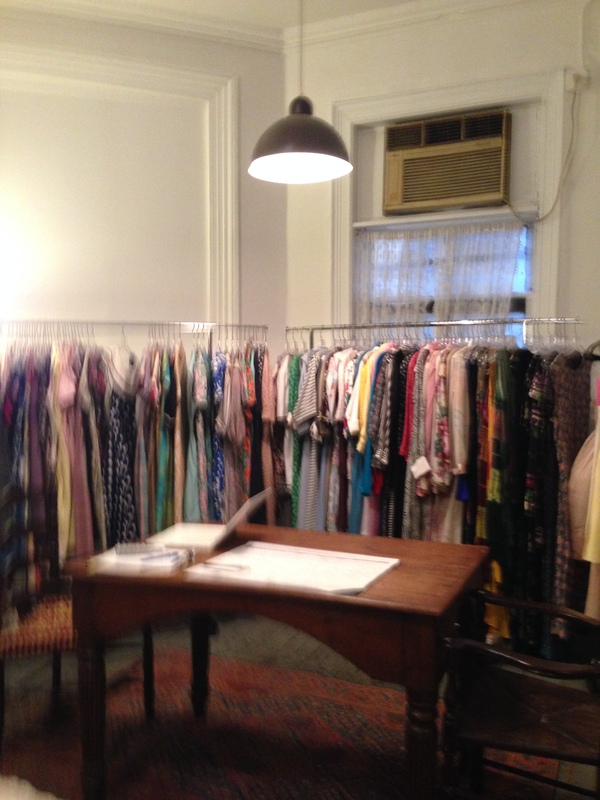 The back room was small, but filled with large racks of gorgeous vintage dresses. The dresses were beautiful. I felt so happy. They would make great costumes for photo shoots. And cute outfits to wear to parties. I looked at each one of the dresses. The attendant walked back into the room. “No boys allowed in here, so feel free to try on dresses wherever you feel comfortable,” she told me. “Ok, thank you,” I said. I was not going to try on dresses. But it was a nice gesture. The phone rang. The attendant answered. From hearing one side of the conversation, I concluded there was a customer who tried on a dress she purchased, but it didn’t look right in the chest region. And the store attendant was telling her she can tie it a different way to make it fit better. The attendant was so nice. She was also very busy. “How much do the dresses cost?” I asked her as she was speed walking out of the room. “And where does Shareen get the dresses?” I asked. I was curious. “She goes to LA a lot and she handpicks the dresses, usually from estate sales,” she told me kindly. Then walked out of the room. 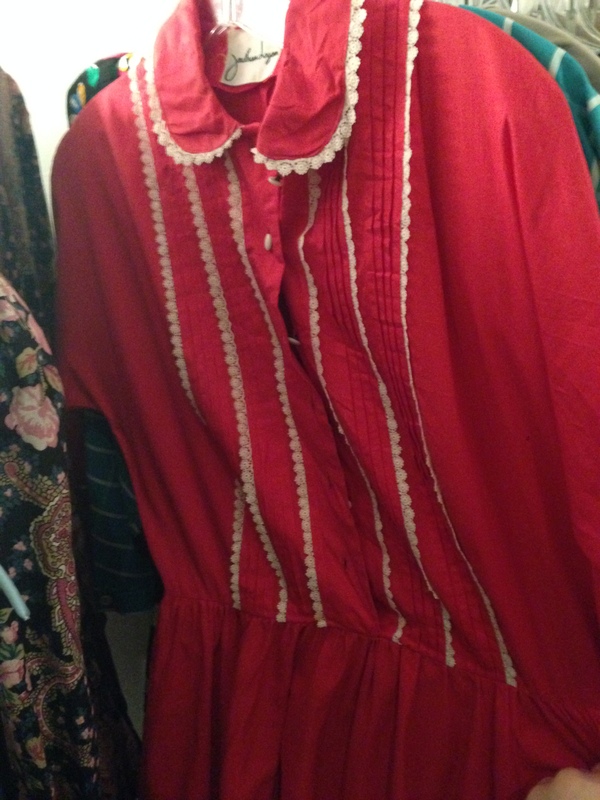 I saw a cute red button up dress by the designer Jonathan Logan. I was not going to buy anything. I was done looking. It was great to get the vintage shopping experience. I walked toward the exit of the store. “Thank you so much,” I said to the attendant. She was tying strings on the bride’s dress. “Thank you,” she said to me with a smile. I walked into the hallway. Down the staircase. There were three black metal doors. I could not remember which I came in from. I walked toward the first door and pushed it. It was locked. I walked toward the second, pushed it. It was locked. I guess the actual worst thing that could happen inside a vintage store would be to literally get trapped inside it. I walked to the third door. Pushed it. It opened. I left. This entry was posted in A Day in the Life, coffee, comedy, humor, New York City, writing and tagged comedy, fear, food, friends, humor, meeting, new york, speedys, vintage clothing. Bookmark the permalink.